Did the Jackrabbit Steal the Piñons? Do you think it was the jackrabbit that is stealing our piñons? If so, go to the Mystery blog and vote! Blacked-tailed Jackrabbits are native hares that are well adapted to life in the semi-arid West. Larger than cottontails, they are about 23″long with gray fur and long legs. Cottontails and other true rabbits are born naked, blind, and need to stay in their nest for about two weeks, but jackrabbit babies are both fully haired, eyes open, and ready to hop and follow their mother. Their key identifying feature is a set of really long ears, tipped with black, which help to alert them to the presence of enemies and to help dissipate body heat. 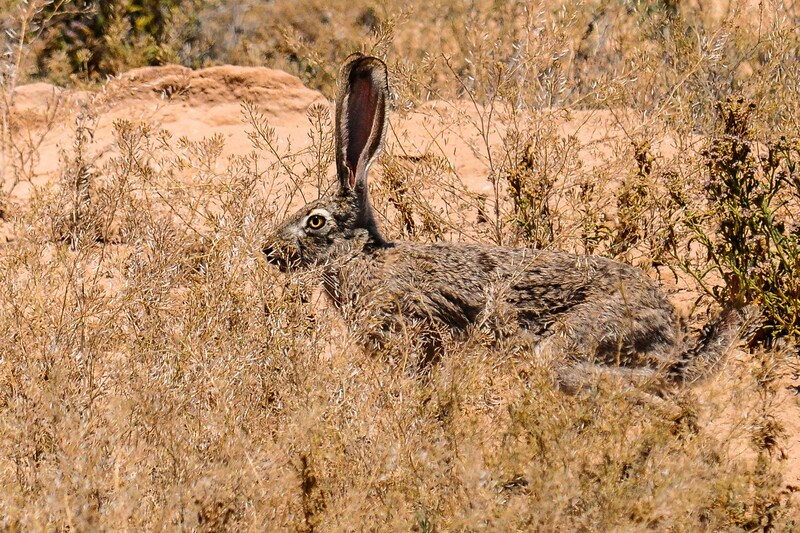 The jackrabbit’s tail is marked by a black streak on the top surface, with a white underside. He is a herbivore who grazes on grasses,buds, bark and twigs. In drought and in winter, he will browse on prickly pear and cholla cactus, avoiding the spines. He uses his speed to flee from predators like the coyote and the bobcat. When chased, he will weave and bob to get away. Jackrabbits are capable of leaps up to 15-20 feet in a single bound! 2008 A Field Guide to the Plants and Animal of the Middle Rio Grande Bosque. University of New Mexico Press, Albuquerque, p. 342. 1963 Sun Father’s Way: The Kiva Mural of Kuaua. The University of New Mexico Press, Albuquerque, pp. 158-159. 2005 Field Guide to the Sandia Mountains. University of New Mexico Press, Albuquerque, p. 191. Tags: jackrabbit, Kuaua, Mystery, Nature, Photography, Pinons, Sharon. Bookmark the permalink. Previous post ← Did She Steal the Piñons ?